The process to produce this part was increasing in time and costs because it involved stamping, tapping, heat treating and plating. The slight gap, labeled on the box lug shown on the left, was causing thread quality problems because alignment couldn’t be correctly attained. Shorten production time with improved methods and remove thread quality issue without costs increasing. A collaborative redesign process led to the introduction of a locking feature, that is labeled on the box lug shown on the right. This feature removed the gap that was previously occurring during production and thread alignment was corrected; improving quality. The next step was to address the lengthy production process. It was determined that a new progressive die would be the best solution. First, the operation to install the new locking feature was built in as a station on the die. Second, tapping was removed as a value-added operation and transferred to the stamping process as another station on the progressive die. Production times and costs were reduced by removing the tapping process as a secondary operation. 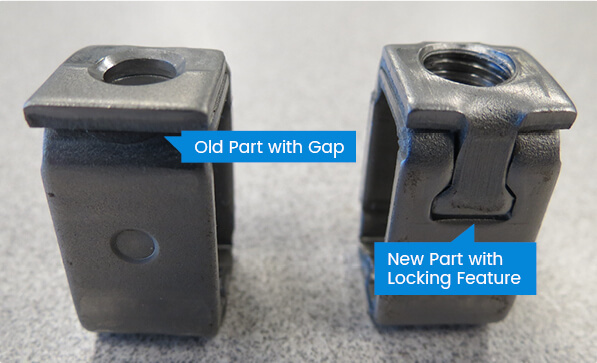 The new locking feature improved the alignment of the threads in the box lug and removed the previous quality issue. Implementing more operations into a new progressive die was a good economical decision for this customer.